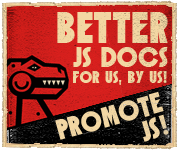 I'll be at JSConf at 24th and 25th of April in Washington, DC, probably speaking about Joose on Track B. Next up is my employer's own Next Conference here in Hamburg. I'm still actively working on the presentation. The topic will be "Building Postmodern Web Applications". I'll look into the building blocks of the post Web 2.0 era web applications and I'll be talking about applying techniques from 90s era desktop apps to the kind of web apps we'll be building. My general example will be the bespin browser-based source code editor which is my current favorite open-source project.